British engineers have demonstrated how the Ka band – a fast and rarely-used satellite communications frequency – could be used to help support unmanned air vehicle (UAV) missions. UAVs need to be able to securely and rapidly transfer large amounts of data during missions, but many existing satellite communications networks are becoming increasingly congested. 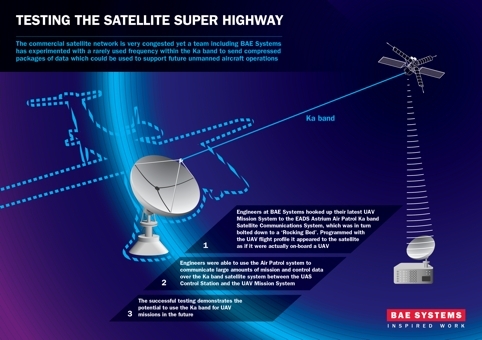 To address this, experts from BAE’s Future Combat Air Systems division have worked alongside engineers from Astrium – Europe’s largest space firm – to find a way to use a ‘communications corridor’ within the Ka-band to send large amounts of data into space. During trials at Astrium’s advanced manufacturing facility in Poynton, Cheshire, the team connected the latest BAE Systems UAV Mission System and associated UAV Control Station to the EADS Astrium Air Patrol Ka band Satellite Communications System. This was bolted down to a moving platform that replicated the profile of a UAV and allowed the systems to be tested as if they were on-board an aircraft flying a real mission. The data was able to complete four ‘hops’ from the Poynton facility to the satellite and from the satellite to Goonhilly Downs station in Cornwall and back again – a distance of 144,000km – more than a third of the distance from the Earth to the Moon.